How would you guess this patient presented and what associated anomalies would you expect to see? This sagittal T2 image of a pediatric patient shows a blunted conus medullaris with sacral dysgenesis. There is also prominence of the central canal in the distal cord. A result of an insult before the fourth gestation week, caudal regression syndrome (CRS) encompasses a spectrum of lumbosacral, anorectal, genitourinary, and lower extremity anomalies. Although most cases are sporadic and the pathogenesis is not completely understood, there is a strong association and increased incidence in infants of diabetic mothers. Clinical manifestations vary from relatively asymptomatic to severe malformations such as sirenomelia with lumbosacral anomalies and fused lower extremities (mermaid syndrome). The most common presenting symptoms are related to a neurogenic bladder. As multiple systems may be affected, it is important to evaluate for genitourinary and anorectal anomalies when presented with spinal anomalies - and vice versa. There are two types of CRS. 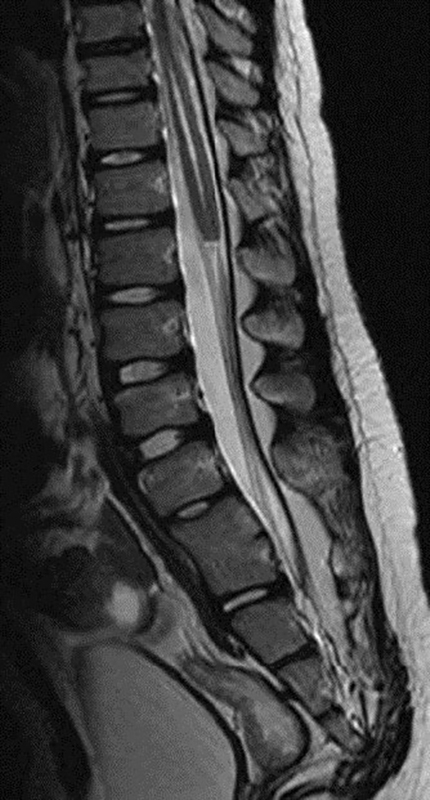 Type 1 results in a high-riding, blunted conus and severe sacral dysgenesis, while type 2 is characterized by a low-lying, elongated cord and conus with less severe lumbosacral anomalies. Severe cases may be identified during antenatal ultrasound screening; however, more mild forms may go undiagnosed into childhood and even early adulthood. MRI allows for full characterization of the extent of anomalies. May L, O'Brien WT SR. At the Viewbox: Caudal Regression Syndrome. J Am Osteopath Coll Radiol. 2013;2(3):32. Dr. May works in the Department of Radiology, Wilford Hall Ambulatory Surgical Center, Joint Base San Antonio-Lackland, TX.